Engineered at Geezer Studios, London. Catalogue number says 'FU20101' on label, 'FU 001' in etching. A record for those who know. 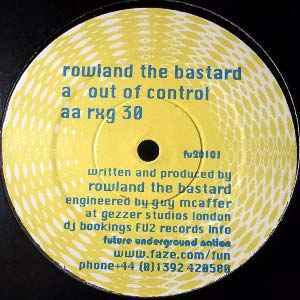 "Out of Control" is a blinding tune, one well worthy of any acid techno pantheon or record bag. Fast, bubbly, and electric, this one is like an acid techno shock-wave, expanding constantly and destroying everything in its path. The track is hard and serious, but isn't overly dark or sinister. It's just direct and avinit. Turn up the volume and blast your mind. RXG 30 is not nearly as special as Out of Control, but it is decent. I've used it before. But in the end, it doesn't hold a candle to the A side.